Since the abolition of the counterpart driving licence in June this year, our Share Driving Licence service has been used to generate over 2.8 million check codes in 205 countries. During this time, we’ve been reviewing user feedback on the service, as well as carrying out usability testing - including those who have limited internet access or skills - to help us to improve the service. Users are asked to provide feedback within the service and over 60,000 a month chose to do so. We also take into account feedback gathered through our Contact Centre calls and use it to consider improvements to our online and telephone services. As well as increasing the check code validity period from 72 hours to 21 days, we’ve also introduced licence start and end dates on to the licence information summary, and made it easier for users to find the service through GOV.UK. To check driving licence information online for your colleagues, customers or pupils you should use our Check Driving Licence service, and not access the driver’s record through our View Driving Licence service. We’ve a number of other improvements and service changes to make in the coming months. Keep an eye out for updates - we’ll keep you informed on what’s changing via this blog. I am impressed that government agencies have at last decided that instead of just talking and having meetings that end up in no improvement in the service that they offer to the public some agencies have taken ACTION and made things easier to use and access the information that is required in the 21st century by means other than call centres in far off places NOW that is easily available to the public,Great well done,Thanks,keep it up. Great news about the continued improvements. 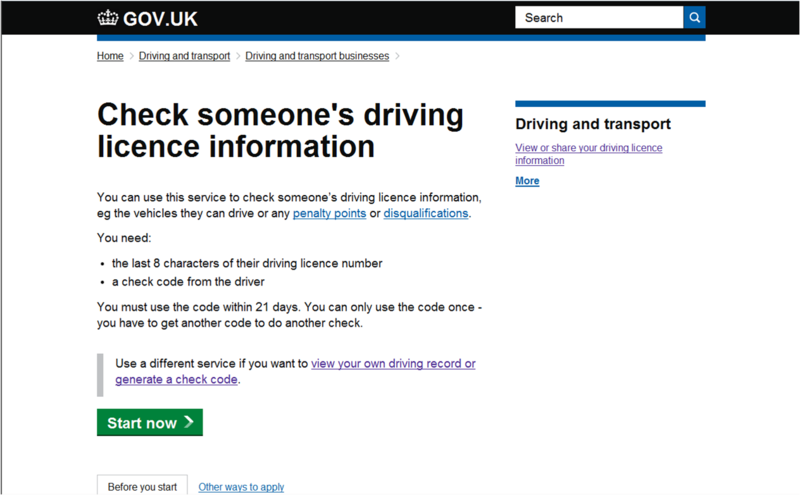 Could the driver's address also be included on the licence check page?